First let us introduce you to our Romahome Duo which we owned from 2003 - 2005. Previous to that we had a Duo without the toilet option, from March 2001 - 2003. Seen here, on the right,with the optional drive away awning, which proves to be very useful on those long stays on one site and gives extra storage space and toilet compartment if needed. 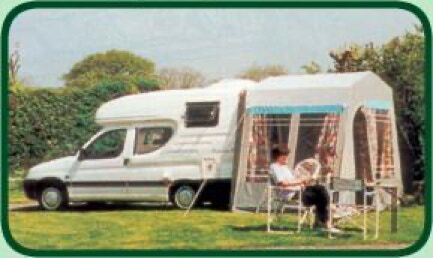 The ease of camping in a Romahome has many people amazed. We quite often arrived on site, turned on the gas, lowered the steadies and by the time we have got out the chairs, the kettle was boiled and we are sitting down to a nice cuppa. ﻿The ﻿usual ﻿comment ﻿from ﻿other ﻿campers ﻿who ﻿are ﻿still ﻿busy ﻿fetching ﻿water ﻿and ﻿setting ﻿up, ﻿is ﻿"Wow, ﻿why ﻿can&apos;t ﻿ours ﻿be ﻿that ﻿easy!" ﻿And ﻿it ﻿is, ﻿even ﻿when ﻿using ﻿the ﻿awning ﻿and ﻿electric ﻿hook ﻿up ﻿we ﻿could ﻿still ﻿be ﻿set ﻿up ﻿within ﻿about ﻿30 ﻿minutes. 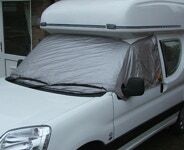 ﻿"A ﻿drive-away ﻿awning ﻿gives ﻿lots ﻿of ﻿extra ﻿space ﻿on ﻿site"
﻿We ﻿carried ﻿the ﻿awning ﻿behind ﻿the ﻿driver ﻿and ﻿passenger ﻿seats. ﻿Some ﻿of ﻿the ﻿later ﻿models ﻿of ﻿Romahome ﻿now ﻿have ﻿the ﻿spare ﻿wheel ﻿behind ﻿the ﻿drivers ﻿seat ﻿so ﻿it ﻿is ﻿not ﻿possible ﻿to ﻿carry ﻿the ﻿awning ﻿there. 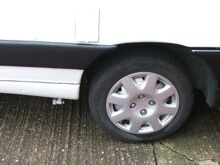 ﻿(If ﻿you ﻿are ﻿ordering ﻿a ﻿new ﻿Romahome ﻿it ﻿might ﻿be ﻿worth ﻿asking ﻿if ﻿they ﻿will ﻿leave ﻿the ﻿spare ﻿wheel ﻿under ﻿the ﻿van ﻿- ﻿we ﻿have ﻿been ﻿told ﻿that ﻿small ﻿variations ﻿on ﻿the ﻿layout ﻿are ﻿possible ﻿and ﻿that ﻿Romahome ﻿are ﻿always ﻿happy ﻿to ﻿try ﻿and ﻿meet ﻿individual ﻿needs). ﻿Otherwise ﻿you ﻿will ﻿probably ﻿have ﻿to ﻿carry ﻿the ﻿awning ﻿on ﻿the ﻿luton ﻿or ﻿in ﻿the ﻿centre ﻿between ﻿the ﻿seats. 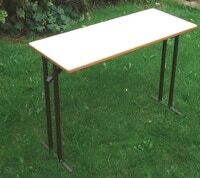 ﻿On ﻿the ﻿luton ﻿(picture ﻿right) ﻿with ﻿the ﻿chairs ﻿we ﻿also ﻿stored ﻿the ﻿folding ﻿table, ﻿and ﻿a ﻿small ﻿black ﻿and ﻿white ﻿TV ﻿(just ﻿7" ﻿square ﻿but ﻿a ﻿great ﻿picture) ﻿this ﻿runs ﻿off ﻿both ﻿12 ﻿volt ﻿and ﻿mains. ﻿This ﻿leaves ﻿plenty ﻿of ﻿room ﻿for ﻿the ﻿other ﻿items ﻿you ﻿need ﻿when ﻿travelling. ﻿Space ﻿is ﻿precious ﻿but ﻿we ﻿never ﻿felt ﻿that ﻿we ﻿had ﻿to ﻿leave ﻿anything ﻿behind ﻿that ﻿we ﻿would ﻿really ﻿have ﻿preferred ﻿totake ﻿with ﻿us. ﻿"Consider ﻿ways ﻿to ﻿save ﻿space, ﻿every ﻿little ﻿helps"
﻿remember ﻿to ﻿remove ﻿the ﻿elastic ﻿before ﻿lighting ﻿though!). ﻿move ﻿about. ﻿(Again ﻿it&apos;s ﻿important ﻿to ﻿remember ﻿to ﻿remove ﻿it ﻿before ﻿using ﻿the ﻿grill). ﻿The ﻿seating ﻿can ﻿be ﻿used ﻿as ﻿either ﻿two ﻿single ﻿beds ﻿or ﻿as ﻿one ﻿very ﻿large ﻿double. 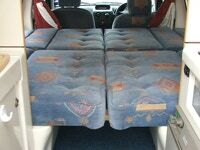 ﻿There ﻿is ﻿lots ﻿of ﻿room ﻿and ﻿it ﻿is ﻿very ﻿comfortable ﻿- ﻿for ﻿taller ﻿people ﻿there ﻿is ﻿a ﻿removable ﻿bed ﻿extension ﻿which ﻿fits ﻿behind ﻿the ﻿driver ﻿and ﻿passenger ﻿seat ﻿to ﻿make ﻿the ﻿bed ﻿longer..
﻿Three ﻿wooden ﻿slats ﻿fit ﻿between ﻿the ﻿seats ﻿and ﻿are ﻿held ﻿in ﻿place ﻿by ﻿velcro, ﻿the ﻿cushions ﻿are ﻿slid ﻿forward ﻿to ﻿the ﻿middle, ﻿then ﻿the ﻿back ﻿rests ﻿are ﻿used ﻿to ﻿fill ﻿in ﻿the ﻿side ﻿areas. ﻿"The ﻿bed ﻿is ﻿quick ﻿and ﻿easy ﻿to ﻿make ﻿up"
﻿ ﻿ ﻿ ﻿ ﻿ ﻿ ﻿ ﻿ ﻿ ﻿ ﻿ ﻿ ﻿ ﻿ ﻿ ﻿ ﻿ ﻿ ﻿ ﻿ ﻿ ﻿ ﻿ ﻿between ﻿the ﻿cooker ﻿and ﻿sink ﻿unit. ﻿ ﻿ ﻿ ﻿ ﻿ ﻿ ﻿ ﻿ ﻿ ﻿ ﻿ ﻿ ﻿ ﻿ ﻿ ﻿ ﻿ ﻿ ﻿ ﻿ ﻿ ﻿ ﻿ ﻿all ﻿the ﻿luxuries ﻿of ﻿home! ﻿ ﻿ ﻿ ﻿ ﻿ ﻿ ﻿ ﻿ ﻿ ﻿ ﻿ ﻿ ﻿ ﻿ ﻿ ﻿ ﻿ ﻿ ﻿ ﻿ ﻿ ﻿ ﻿ ﻿the ﻿cab, ﻿others ﻿at ﻿the ﻿other ﻿end. ﻿We ﻿found ﻿that ﻿when ﻿sleeping ﻿at ﻿the ﻿cab ﻿end ﻿the ﻿pillows ﻿often ﻿fell ﻿down ﻿into ﻿the ﻿gap. 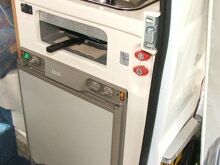 ﻿Another ﻿advantage ﻿of ﻿sleep ﻿with ﻿heads ﻿towards ﻿the ﻿sink/cooker ﻿end ﻿is ﻿that ﻿you ﻿have ﻿a ﻿headrest ﻿on ﻿the ﻿lift ﻿up ﻿flaps ﻿and ﻿it&apos;s ﻿also ﻿possible ﻿to ﻿have ﻿the ﻿TV ﻿on ﻿the ﻿luton ﻿and ﻿watch ﻿TV ﻿in ﻿bed! To help keep warm at night it&apos;s well worth investing in a &apos;Silver Screen&apos;. These insulated covers fit either on the outside or inside of the vehicle and help keep it warm, they also help keep it cool on very hot days too. They also prevent condensation on the inside windscreen. Make sure you buy one that is designed for your vehicle as sizes and fittings do vary considerably. "A Silver Screen will keep you warm or cool depending on the weather!" "Lots of cupboard space means nothing has to be left behind"
The cupboard above the sink we kept plates, cutlery (in a plastic container, coffee pot and first aid things. Above the cooker were stored, glasses, coffee/sugar etc. storage jars and a few spices. To save space we only travelled with enough equipment for ourselves (2 cups or mugs, two glasses etc) so if we had visitors it was a case of bring your own glass!! 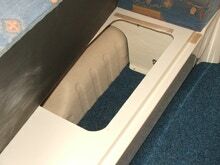 These pictures on the show the underbed storage (right pic) and the top front cupboards (left pic). 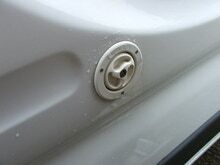 Most Romahomes are equipped to run on electricity (240v) via a electric hook up socket on the outside of the van, you will need an electric hook up lead to plug into the electric socket on campsites. "Using the electricity is safe and easy if you follow the instructions"
The outside plug in socket has a cover to keep out the wet - if you find it hard to lift the cover when it&apos;s closed try using the end of your electric hook-up cable socket , this has a small notch which we are sure was designed just for this job. Inside the van - in our Duo it was under one of the bench seat - you will find the mains isolation switches, use your handbook to fully understand how these work and what each does. One persons clothes, toiletries bag and towels were kept in the bench next to the sink and the other&apos;s in the bench next to the cooker. Depending on how long we were travelling then there was more or less space available. The top cupboards were for food and one for our binoculars, books, games and other small items. 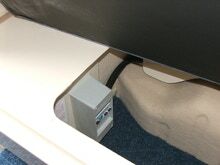 The pictures show the socket on the outside of the van and the internal unit. We have been told that it is important to fully uncoil your electric hook-up cable when on site and connected to the electricity as otherwise you can overload the cable and risk damage or a short circuit. Your Romahome will be equipped with a fridge and cooker that runs off gas, you will need a gas bottle to run these appliances. "Like electricity, gas is safe and easy if you follow the instructions"
Gas is stored in an outside locker so is easy to get at and change. The locker will only hold two Camping Gaz 907 bottle and are not tall enough to take Calor or other types of bottle. 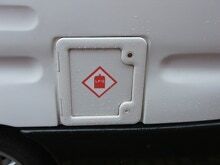 The regulator is also in the locker Although for van built after 2003 it is now compulsory for them to be fitted with fixed regulators. There is an on board toilet option (porta potti) available which proves to be useful but it does mean you lose the under sink cupboard. We never regretted this and found that it was well worth the loss. It&apos;s not much fun having to get dressed and trek across the campsite in a howling wind or rain! Although the toilet compartment in the awning is a good second best and it means again that you don&apos;t have to dress and go out. The on board toilet is situated under the sink. When required for use the sink lifts up and slots into an upright position above the toilet out of the way. For privacy there are curtains which divide the toilet area from the living area and the rear blind and window curtain give privacy from outside. The pictures show a view taken from inside and outside the van, they show the toilet in situ. 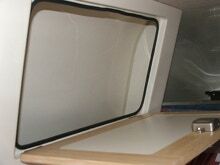 Here you can see that the toilet is completely enclosed under the sink unit, it has a removable door for ease of access. We always kept a small push button air freshener in the cupboard to keep it smelling fresh. Although it doesn&apos;t offer the luxury of a bathroom unit it proves invaluable on long journeys, especially in France where public toilets are few and far between. It is also a boon when stuck in the inevitable motorway tail-backs which seem so common place these days! . "Whether you choose the onboard toilet option or the compartment in the awning it&apos;s better than a trek across the campsite"
The other option for the toilet is to put it in the awning or use a toilet tent. 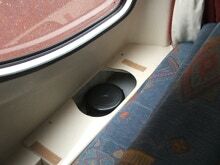 When travelling the toilet is then stored under one of the seats and can, in an emergency still be accessed for use. The Duo is equipped with onboard tanks for both fresh water and waste water, we don’t use water out of the fresh water tank for drinking but prefer to fill a bottle on site, however we do use it for washing ourselves and the dirty pots. The water tanks help you to be totally self sufficient and means you can stop off for cups of tea or coffee along the way without worrying about finding water. or somewhere to empty the waste. 20 litres of water can last quite a long time and we very rarely have to fill up more than twice in a weeks holiday - although if you are drinking water &apos;neat&apos; and not boiling it for tea and coffee etc. 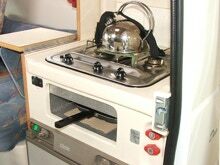 then it would be better to fill your glass from the campsite mains tap as water in the tank for too long really should be boiled. The tanks are situated out of site tucked snugly behind the seating where there is also inspection caps for checking how full they are. 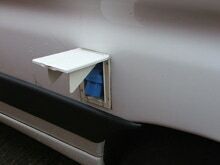 Fresh water is filled from outside via a lockable filler cap and the waste is emptied via a tap just under the side of the van. ﻿The ﻿windows ﻿all ﻿have ﻿blinds ﻿and ﻿flyscreens ﻿- ﻿except ﻿the ﻿lower ﻿side ﻿“teardrop” ﻿windows ﻿which ﻿open ﻿to ﻿about ﻿1", ﻿these ﻿are ﻿great ﻿for ﻿letting ﻿some ﻿fresh ﻿air ﻿in ﻿at ﻿night ﻿and ﻿the ﻿bugs ﻿can&apos;t ﻿(usually! )get ﻿in ﻿because ﻿the ﻿curtains ﻿fit ﻿so ﻿tightly. ﻿The ﻿fridge ﻿(left)- ﻿This ﻿is ﻿situated ﻿under ﻿the ﻿cooker ﻿and ﻿runs ﻿on ﻿mains ﻿electric ﻿(240v), ﻿Gas ﻿or ﻿battery ﻿(battery ﻿only ﻿while ﻿travelling). ﻿It ﻿can ﻿hold ﻿quite ﻿a ﻿lot ﻿of ﻿things, ﻿has ﻿two ﻿shelves, ﻿door ﻿bottle ﻿storage, ﻿butter ﻿rack ﻿and ﻿a ﻿small ﻿freezer ﻿compartment. ﻿Inside ﻿the ﻿van ﻿The ﻿picture ﻿(bottom ﻿right) ﻿shows ﻿the ﻿full ﻿length ﻿of ﻿the ﻿van ﻿taken ﻿from ﻿the ﻿outside. ﻿The ﻿cooker ﻿(right) ﻿- ﻿runs ﻿off ﻿gas ﻿and ﻿has ﻿two ﻿rings ﻿plus ﻿a ﻿pretty ﻿ineffective ﻿grill ﻿underneath. ﻿You ﻿will ﻿notice ﻿the ﻿little ﻿flap ﻿at ﻿the ﻿side ﻿of ﻿the ﻿cooker ﻿which ﻿gives ﻿a ﻿little ﻿extra ﻿worktop ﻿space, ﻿there ﻿is ﻿a ﻿flap ﻿on ﻿the ﻿side ﻿of ﻿the ﻿sink ﻿as ﻿well. ﻿There ﻿is ﻿a ﻿sink ﻿opposite ﻿the ﻿cooker ﻿and ﻿fridge ﻿with ﻿a ﻿cupboard ﻿above, ﻿the ﻿water ﻿is ﻿pumped ﻿from ﻿the ﻿water ﻿tank ﻿to ﻿the ﻿sink ﻿via ﻿a ﻿electric ﻿pump ﻿which ﻿runs ﻿from ﻿the ﻿leisure ﻿battery. 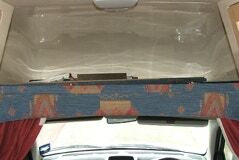 ﻿The ﻿sink ﻿top ﻿comes ﻿covered ﻿with ﻿a ﻿chopping ﻿board ﻿but ﻿we ﻿found ﻿this ﻿needed ﻿to ﻿be ﻿stowed ﻿away ﻿when ﻿travelling ﻿as ﻿it ﻿could ﻿be ﻿a ﻿really ﻿dangerous ﻿missile ﻿in ﻿an ﻿accident. 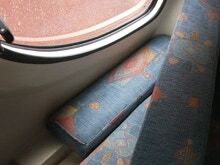 ﻿There ﻿are ﻿two ﻿bench ﻿seats ﻿which ﻿make ﻿up ﻿to ﻿two ﻿single ﻿or ﻿a ﻿large ﻿double ﻿as ﻿described ﻿above. 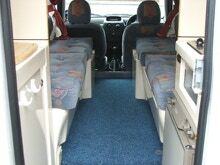 ﻿A ﻿narrow ﻿table ﻿(pictures ﻿left) ﻿which ﻿fits ﻿between ﻿the ﻿bench ﻿seats ﻿enables ﻿you ﻿to ﻿sit ﻿and ﻿eat ﻿your ﻿meals, ﻿it ﻿isn’t ﻿possible ﻿to ﻿stand ﻿up ﻿in ﻿the ﻿living ﻿area ﻿of ﻿the ﻿van ﻿(unless ﻿you ﻿are ﻿very ﻿short) ﻿but ﻿thanks ﻿to ﻿a ﻿step ﻿down ﻿a ﻿6ft ﻿tall ﻿person ﻿can ﻿stand ﻿in ﻿the ﻿galley ﻿area ﻿when ﻿cooking ﻿or ﻿washing ﻿etc. ﻿The ﻿bench ﻿seats ﻿are ﻿ideal ﻿for ﻿lounging ﻿on ﻿and ﻿reading ﻿or ﻿just ﻿watching ﻿the ﻿world ﻿go ﻿by ﻿as ﻿you ﻿relax ﻿on ﻿a ﻿campsite. ﻿It ﻿isn’t ﻿recommended ﻿to ﻿travel ﻿with ﻿passengers ﻿in ﻿the ﻿back ﻿because ﻿there ﻿are ﻿no ﻿seats ﻿belts ﻿in ﻿this ﻿model. ﻿The ﻿Romahome ﻿Duo ﻿is ﻿a ﻿wonderful ﻿invention ﻿and ﻿you ﻿might ﻿find ﻿yourself ﻿with ﻿the ﻿occasional ﻿stowaway ﻿who ﻿doesn&apos;t ﻿want ﻿to ﻿be ﻿left ﻿at ﻿home!